Portrayers: John Nash, March 14, 1989 - September 16, 1994. Christopher Conroy, November 24, 1994; April 1995 - August 1995. 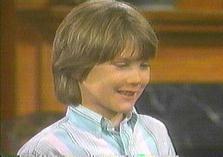 Spencer Treat Clark, October 27, 1995 - April 7, 1999. Introduction Scenes: (John Nash) Vicky Hudson's apartment, with Vicky Hudson and Jake McKinnon. (Christopher Conroy) Vicky Hudson's house, with Vicky Hudson. (Spencer Treat Clark) Vicky Hudson's house, with Vicky Hudson. Exit Scene: (John Nash) An airport, with Ryan Harrison and Donna Love. Birthday: (Former) March 14, 1989. (Current) 1988. Other Aliases: Steven Michael Frame (full name). Named after his paternal grandfather. Relatives: Vicky Hudson, mother. Jamie Frame, father. Kirkland Harrison, half-brother. Donna Love, maternal grandmother. Michael Hudson, maternal grandfather. Rachel Cory, paternal grandmother. Steve Frame (RIP), paternal grandfather. Sam Lucas, great-uncle. Marley Hudson, aunt. Amanda Cory, half-aunt. Matthew Cory, half-uncle. Nick Hudson, half-uncle. Elizabeth Hutchins, half-aunt. Cory Hutchins, half-uncle. Alli Fowler, half-cousin. Jasmine Cory, half-cousin. Elizabeth Love (RIP), maternal great-grandmother. Reginald Love (RIP), maternal great-grandfather. Clara Hudson, maternal great-grandmother. Ada Hobson (RIP), paternal great-grandmother. Gerald David (RIP), paternal great-grandfather. Margaret * (RIP), maternal great-great-grandmother. Joe * (RIP), maternal great-great-grandfather. Willis Frame, great-uncle. Emma Frame Ordway, great-aunt. Jason Frame (RIP), great-uncle. Janice Frame (RIP), great-aunt. Henry Frame, great-uncle. Vince Frame, great-uncle. Sharlene Frame, great-aunt. John Hudson, great-uncle. Peter Love, great-uncle. Nicole Love, great-aunt. Nancy McGowan, great-half-aunt. Frankie Frame (RIP), second cousin. Molly Ordway, second cousin. Evan Frame, second cousin. Josie Watts, second cousin. Dean Frame, second cousin. Gregory Hudson, second cousin. Susannah Lucas, second cousin. Charlie Frame Winthrop, third cousin. Gary Sinclair Jr. (RIP), third cousin. Medical History: Went in septic shock after being born at home.